Everest View Trek | Adam Tours & Travel Pvt. Ltd.
Everest View trek provides you the opportunity to fulfill a desire of seeing the highest superb view of Everest and a close look at Sherpa culture. This Everest view trekking is suitable for novice’s trekkers who have a short time to spend and special desire to see world highest mountains. The trek to the base camp of the Everest has become one of the most popular trekking route in Nepal. This area is populated by Sherpas; the major attractions of this area are the majestic mountains, the high mountain villages, the isolated monasteries, Namche Bazzar, the gateway of the Everest Region, local people, Tyangboche monastery below the distinctive peak of nearby Amadablam and Everest Your effort is rewarded by the stunning view of Everest rising behind the Lothse, Nuptse wall and the local peoples. This trek brings you the very great view of four 8000m peaks (Mt. Everest-8848m, Cho Oyu-8153m, Lhotse-8516m and Makalu-8463m). And you can have a great view of Nepal most beautiful mountain, Ama Dablam (6856m) (The “Matterhorn of Khumbu”). This Trekking will not take you to the Base Camp of Everest but will provide you the opportunity to experience the lively culture of Sherpa People and the glimpse of the mighty Everest. After having a spectacular flight to Lukla you will enter a Solukhumbu Region, famous for it’s proximity to the world’s highest mountain and for its Sherpa villages and monasteries. Our Everest view trek continues through the lush vegetation of Sagarmatha National Park, which is one of the Natural world heritage sites of Nepal declared by UNESCO, with pine forests, rhododendron flowers and an abundance of wildlife to Namche Bazaar (3440m). The trek to Tengboche monastery is termed as Everest view trek. Tengboche is reputed by photographers as one of the best places to capture the awesome beauty of Mt. Everest, Amadablam and their neighboring peaks. 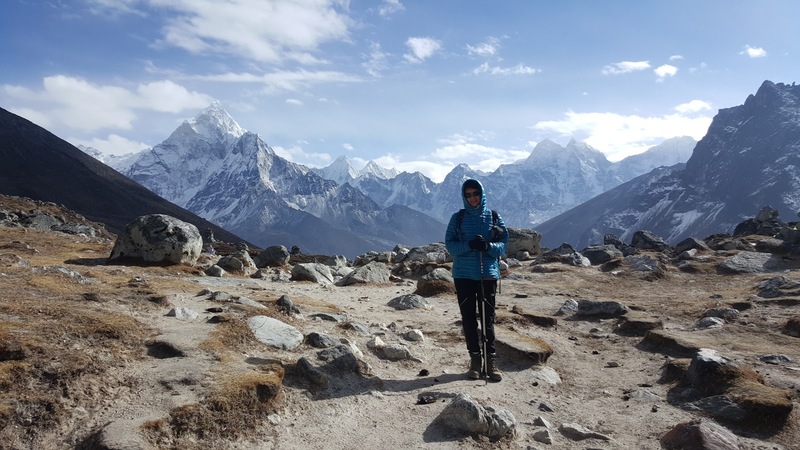 Similarly, a visit to Syangboche will offer you perhaps the most stunning view of Everest and other Khumbu mountains in the whole Everest region. In Khumbu Region, your senses come fully alive, and all the views are magical. Lively villages and ancient monasteries are captivating and invite exploration, but it’s the friendly Sherpa people, whose hearts are as big as the mountains themselves, that you’ll remember for a lifetime! The Everest view trekking boasts many more spectacular and beautiful mountains, as well as some of the most rewarding trekking anywhere in the world. To give you a look into the heart of the villages of Sherpa people, their ancient culture and magnificent views of highest mountains in the world, we offer you an exceptional 11 days trek. Get your baggage packed for your beautiful journey in Nepal Everest region and seeing the Panoramic view of the tallest mountains on Earth back to Kathmandu There is enough time for you to visit the shop, explore and relax in Kathmandu after. Day 03: Flight KTM to Lukla and trek to Phakding (2652m): walking distance 2-3 hours. Day 07: Tengboche Trek to Khumjung: walking distance 4-5 hours. Day 08: Khumjung trek down to Phakding (2,652m): walking distance 5 hours. Day 09: Phakding trek back to Lukla (2,850): walking distance 3-4 hours. Early morning we flight from Kathmandu to Lukla via mountain flight of about 40 minutes scenic flight. With clear weather we get fantastic views of the mountains, including Everest as we enter deep gorge of the Dudh Kosi valley. You begin your trek from Lukla following a gentle climb up the mountainside on the left bank of the Dudh Koshi River. Along the way you will have a view of Mt Nupla (5885m) Kusum Kangaru (6367m) and Mount Kwongde Range. We then take an easy walk for about two hours to Phakding village. However, if interested in additional activities we can take a side trip to a nearby monastery. Have some rest time rest strolling around the village for local knowledge. From Phakding the trail follows the Dudh Koshi valley north, meandering through the pines, crossing it twice by small suspension bridges before reaching the village of Monjo, the entrance gate of the Sagarmatha National Park. Beginning with a slight climb to Jhorsalle, the trail passes waterfalls and other culturally and naturally occurring items of interest. Villages are interspersed with magnificent forests of Rhododendron, Magnolia and fir. Along the way to you will be rewarded with your first glimpse of Kusum Kangru (6369m) Thamserku (6608m), Everest (8848m) and Nuptse (7879 m). The trail climbs through the forests and bridges until we reach the confluence of the Dudh Koshi and Bhote Koshi rivers. After a final steep ascent of about two hours we get first sight fist of at Mt. Everest, peering over the Lhotse-Nuptse ridge. A steep climb up to the beautiful village of Namche bazaar (3440m) will afford you further spectacular views and a comfortable place to spend the second night of the trek. Accommodate your body to high altitude of Namche as you have gained much height previous day. Set in a natural amphitheatre looking across to the jagged ridge of Kongdi RI (6187m), Namche Bazzar is one of the most attractive settlements in the khumbu region. We will have a full day rest so that we won’t face any problem ahead. You have full day leisure for wonderful panoramic view or stroll around the market You can also enjoy the splendid views of Everest, Ama Dablam, Thamserku, Nuptse, Lhotse, Tawche, and Kwangde and so on. Retrace the journey back to Shanasha, from Shanasha where the trail from Khumjung, Gokyo and to Namche meets. Trekking up for about 2 hours and then leveling off until we reach the village of Khumjung.Heading to Khumjung a largest settlement of Khumbu Valley is one of the oldest and largest Sherpa settlements in the Khumbu region (Everest region). The village is the seat of Khumjung village development committee which include Khunde, Khumjung, Tyangboche, Pangboche, Pheriche, Dole, Machhermo, Lobuche, Dingboche, Gokyo and some small town , the valley is surrounded by the snowy peaks of Kongde and Thamserku. We can take a take a short hike up to the monastery to view the yeti “scalp” at the Khumjung monastery. It will be just a 3hr easy and gentle trail back to Lukla.Thetrail drops steeply and runs level through out the day.Enjoying the lush green scenery around and passing through the incredible mountain scenery and local Sherpa village arrival in Lukla. You’ll have time to stroll around the local areas. In the evening you can enjoy a typical Nepalese dinner and cultural show.